It's time for another great Twentieth Century Fox Home Entertainment sponsored movie giveaway here on MommyBlogExpert. Enter to win your own copy of the new kids live action comedy Russell Madness Blu-ray DVD + Digital HD so your child can watch this anywhere: on the TV, laptop, tablet or smartphone. With a real dog and monkey in the leading roles acting like humans with robust personalities, the kids are going to want to watch this over and over again. Russell Madness includes English and Spanish subtitles and has an approximate run time of approximately 92 minutes. Available as of March 10, 2015 on Bluray + DVD + Digital HD for $29.99 list. For more on Russell Madness follow the movie's official Facebook page. MommyBlogExpert's Russell Madness Bluray + DVD + Digital Giveaway ends April 14, 2015 at 12 am PT and is open to legal residents of the U.S. only. 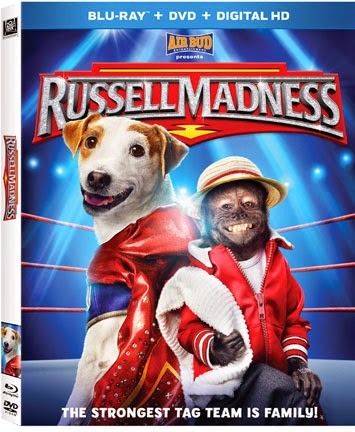 Fox Home Entertainment will award ONE (1) Russell Madness Blu-ray + DVD + Digital combo ARV $29.99 to winner. Winner of this MBE contest will be selected at random from all entries and will be notified via email and must respond within 24 hours to claim their prize. Foxconnect.com and following the movie studio on Facebook and Twitter. FTC Disclosure: In connection with this #RussellMadness post series, I disclose that I am a Fox Home Entertainment Insider #FHEInsiders brand ambassador. I received the Bluray DVD and was invited to attend several hosted events to facilitate this giveaway, the associated movie review and Russell Madness free printable activity sheets posts. 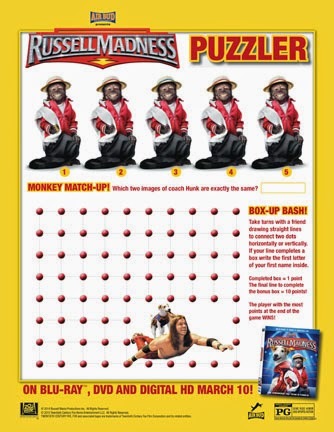 In addition to complimentary printables for readers, Fox is supplying the prize and shipping for MBE's Russell Madness Blu-ray DVD Giveaway. However opinions here are my own. See complete FTC Disclosure information that appears at the bottom of MommyBlogExpert's main page and at the bottom of every individual post on this blog, including this one. I'd be watching this with my daughter! my 13 yr old and both my grandsons would watch this movie if I were lucky enough to win. We will watch as a family if we win! I will watch this movie with my family if i win it! I would watch this with my grandsons! I will watch this with my two little grandsons. My would love to watch this movie with me. I would watch it with my oldest daughter. I would like to see this movie with my nephew.